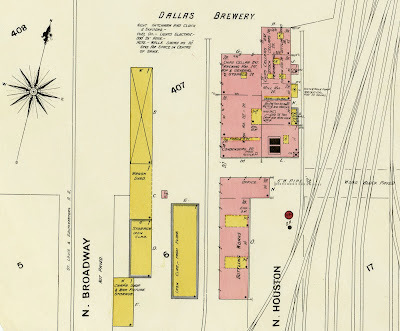 Since Throwback Thursday seems to be a thing these days, I thought it might be interesting to play along while looking at some images of the old Dallas Brewery. 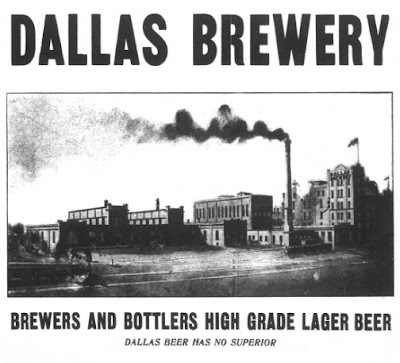 The business, which originated at the hands of Anton Wagenhauser in 1885, was the largest pre-Prohibition brewing operation in the city, and it was located on the site currently occupied by the present-day Dallas Brewery Building at 703 McKinney Avenue. Present day Dallas Brewery Building (left: Google Maps, right: Brian Brown/Beer In Big D, click to enlarge). 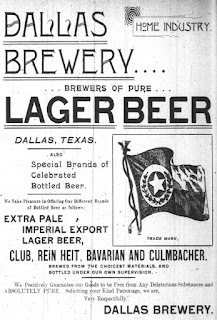 One reason to bring up the topic is because co-author Paul Hightower and I weren't able to locate any images of the original structure or brewery advertising for inclusion in our book on local beer history, entitled North Texas Beer. The search didn't end with the book's publication, however, and I'm happy to say I've since found a few usable images in the public domain. 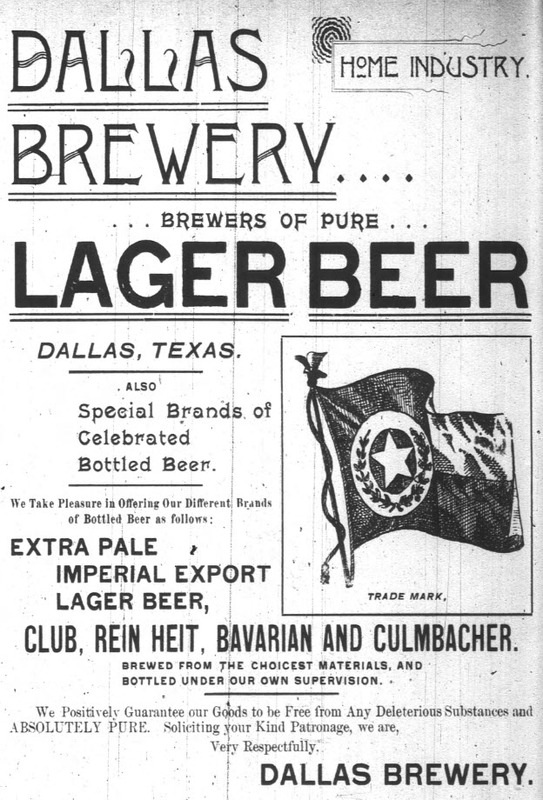 Ad from the 1894-5 Dallas City Directory showing the brewery's Texas flag-inspired trademark. The flag appeared in promotional materials and on glassware available at the time (click to enlarge). Another reason to look more into the history of the building is to perhaps set record straight on the origins of the Brewery Building as it stands today. While there are remnants of the old Dallas Brewery on the site in question, despite what you may read in area newspapers or real estate ads, the four-story structure at the intersection of Woodall Rogers and I-35E wasn't built in 1890. To start, no four story structure other than a portion of the brewery itself is shown on Sanborn Fire Insurance Maps up to the year 1905 (the number of stories is indicated in the upper right corner of each rectangular section of the buildings in the map below). 1905 Sanborn Fire Insurance Map of Dallas (University of Texas Libraries, click to enlarge). While the physical plant reaches upwards of four stories at different points (not counting smokestacks and/or flagpoles), no support building nearby rises higher than two stories tall. This can be seen more clearly in a rendering of the full site from the 1906 Dallas City Directory. (rotate 90 degrees counter-clockwise to compare to Sanborn map, click to enlarge). Okay, so when was the Dallas Brewery Building actually built? Evidence to answer that question can be found in newspaper accounts from the Dallas Morning News, which tell us that the site was cleared "for the construction of a four-story and basement warehouse building for the Morgan Warehouse and Industrial Company" in March 1925. 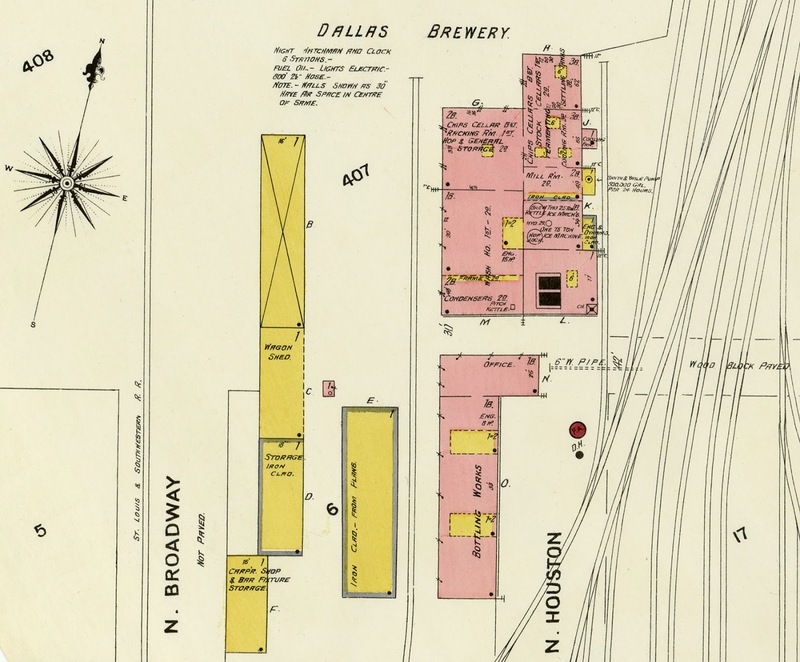 Morgan Warehouse was a distribution business run by those behind the Dallas Brewery after Prohibition shut down the brewing industry in 1920 (the group failed to stay afloat as a soft drink manufacturer prior to 1925). Anything remaining after the initial demolition was removed in 1930, also according to the News, with other refurbishments over the years leading to building we see today. Regarding the basement mentioned in 1925, it just so happens that two modern-day breweries operated in that space during the 1990s (these were the Dallas Brewing Company and the St. Andrew's Brewing Company). As for what's left from around 1890, that's limited to a 50-foot artesian well that was uncovered by workers in 1983. Up until 2011, visitors to the building could actually see the well, which was left exposed inside Newport's Seafood Restaurant. It must have created some level of intrigue, since a 1999 story in the Dallas Observer says that waiters would actually dive into the murky waters during the summer in order to explore the well's depths. Alas, once Newport's closed and Draft Picks Sports Bar moved in at the end of 2011, the well was capped for liability reasons, essentially locking away one of the lasts bits of history from the city's bygone brewing era.